Ulli sammanthi aka pearl onion chutney is a family favorite, especially my brother’s. This fiery chutney has character. 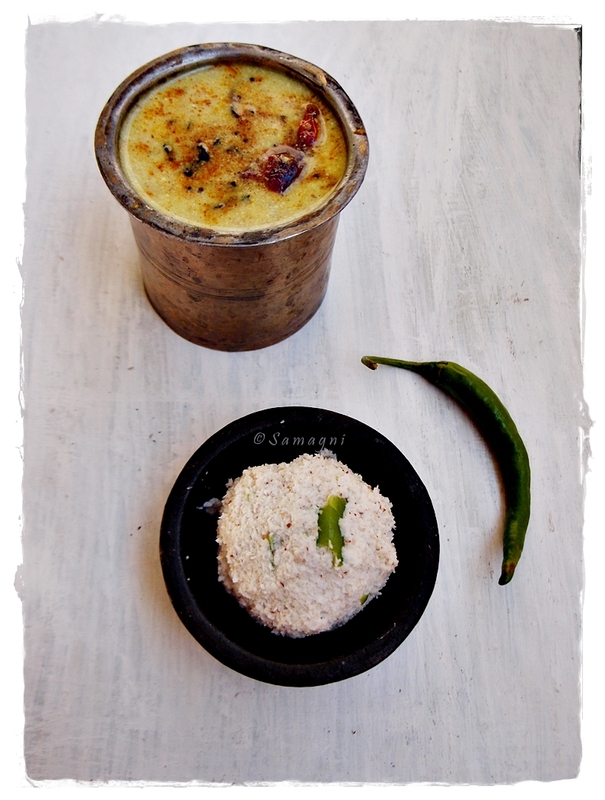 In Kerala, this chutney is a famous combo with boiled tapioca (kappa puzhungiyathu). But many Kerala homes make it as a dosa accompaniment also. Our family’s favorite combination is this chutney along with uthappam. 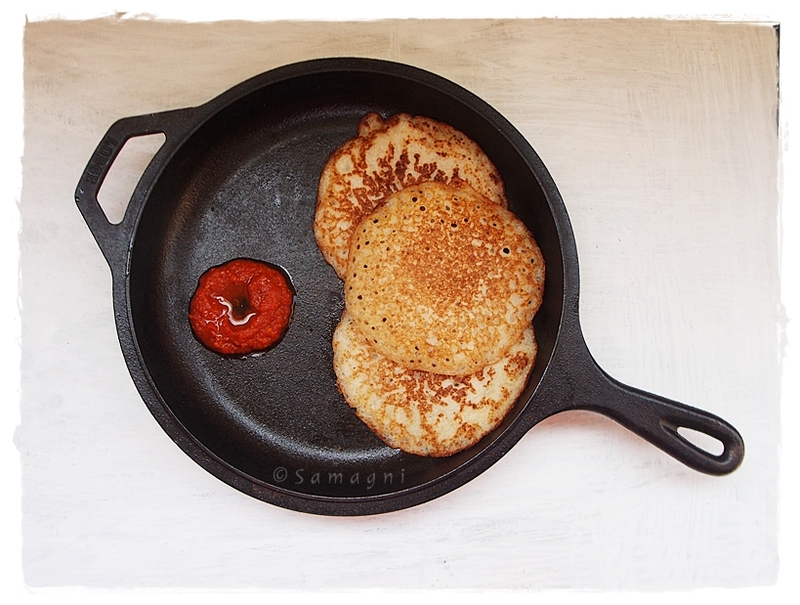 On a day that this chutney is made, I lose count of the number of uthappams/dosas I gobble up. 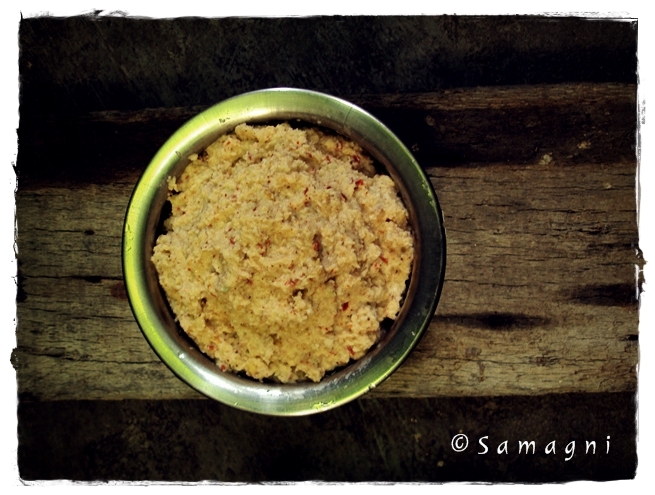 My mother grinds this chutney in ammikkallu (a stone grinder with a flat stone surface and a pestle that is rolled on this surface). This chutney tastes best when ground using stone. The mixer grinder tends to mildly heat up the ingredients due to the high speed. Grinding using stone retains all the natural flavors of this minimalistic chutney. My mother would be in tears by the time she is done with the grinding because of the shallots. Also your hands can be get heated up because of the chilies. You can use a mixer also to make this chutney. You could use red chilly powder but the chutney tastes best when you use whole dry red chilies. When grinding this chutney in a mixer, soak the dry red chilies in water for an hour. If you are in a hurry, pour hot water in the chilies and keep aside for 5 mins before you start grinding. Adding coconut oil to this chutney is key as it adds a wonderful flavor and helps you tolerate the fiery chutney. Soak the red chilies in a little bit of water for 1-2 hours. Peel the shallots. If you are using the stone grinder, first crush the red chilies and grind them a little bit. Add the shallots. Add salt. Do not add any water while grinding in a stone grinder. Keep grinding. Be prepared to shed plenty of tears while grinding. Grind until you get a smooth paste. Gather into a bowl. Add coconut oil. Mix well and use. If using mixer, add the red chilies to the jar and give it a few turns to crush it well. Add shallots, and salt and grind until you get a smooth paste. You do not need to add water. Remove into a bowl. Add coconut oil. Mix well and serve. Don’t forget to brush your teeth after you are done eating! If you do not like the taste of raw shallots (which is highly unlikely), you can also improvise this by sauteing the shallots and red chilies in a little bit of oil before making the chutney. If you enjoyed reading this post, please consider subscribing to this blog. It’s free and you will receive e-mail notifications with each update.